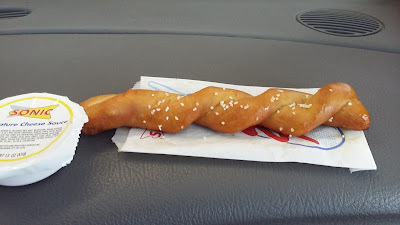 Jason and I made it a point to head over to Hannibal, MO Monday evening to indulge in some delicious food and the new Soft Pretzel Twist available at SONIC Drive-In. SONIC just added the Soft Pretzel Twist to their menu. Available for a limited time only, this savory warm snack is a golden-brown pretzel, buttered and sprinkled with granular salt and served with a Signature Cheese Sauce for dipping. Goodness gracious, they were good! The price for each Soft Pretzel Twist with Signature Cheese Sauce is $1.99 plus tax. I ordered four and my husband ordered one. The Soft Pretzel Twist had just the right amount of salt sprinkle, and it was so buttery soft and delicious. I even microwaved one the next day and, amazingly enough, it stayed the same texture and consistency. It did not harden, but instead was just as soft and yummy as the day before. The cup of Signature Cheese Sauce is plenty for each pretzel. I even had some left over to dip my fries in. Bring the family together at your local SONIC to try the new Soft Pretzel Twist. But hurry - This snack is available for a limited time! One person will win a $4.57 SONIC Drive-In Gift Card. The last time we went there was a few years ago. I don't eat very often because it is not convenient. But I will go and try the pretzel. we only eat there a few times per year when we're in the area. I eat at Sonic a few times in a year especially when they have special promotions going on to get specials pricing on their food and shakes. We got a Sonic a few years ago and I still haven't been! I need to go soon though. I eat at Sonic a couple times a year. We eat at Sonic about once a month. We get drinks there about twice a month. I am there about once a month sometimes more. I was there yesterday and had a hotdog and drink. I usually go once a month as a treat! Leave a comment on this blog post with about how often you eat at SONIC Drive-In in a year. We go every other month or so. We eat food at Sonic aa few times a month, but we get shakes there much more frequently, especially in the summer when they are half price after 8pm. I have not been to Sonic in years but I like the shakes. I only eat there once or twice a year. I go there maybe once or twice a month. i used to eat there all the time, but i changed job locations so not as much as I'd like. We eat at Sonic about once a month when we go to Danville, VA! I eat there a couple times a month. I eat at Sonic once or twice a year, when I'm on vacation. Have not been there in a few years. We stop at Sonic every couple of months. I probably eat there once a month to eat and more often when they have 1/2 price shakes. We go together about 2 times a month. my daughter goes there every work day for drinks and lunch. We go to Sonic about once a month. We don't have any very nearby, so we only have it on road trip, maybe twice a year. I've never been to one. Everytime I go to visit my Dad I want to stop at Sonic but thus far it never worked out. Still hoping. They do not have one near us. We eat at Sonic almost weekly. once in awhile when we want a great treat. Go a few times a year. not too close but try to splurge for a slushie when in the area - YUM. So I would say quarterly. We eat there about 4 times a year. Probably about 3-4 times a year would be my best estimate. I never eat at SONIC Drive-In. I live about a mile away so probable three times a month. In a years time, I go every few months. generally only when traveling as we don't have one near us. I eat at Sonic 10-12 times a year. I have never eaten there. e have got shakes several times to go and they are great. I have never entered for an odd amount on a card like this before. I probably eat there about 4-5 times a year. A couple times a year, maybe, when we're in a hurry and their fancy hot dogs sound appealing. Also? Why $4.57? So random! We eat at Sonic about 5 times a year or so. Thanks for the chance to win! i eat at sonic a few times a year. We eat at Sonic about once a month! We go to Sonic about 6 times a year. I've actually never ate at Sonic, but would love to give it a try! Unfortunately we dont live close to one, but when we visit my aunt, there is one right down the road. I'd say we visit about six times a year. My daughter and i love it. We probably go once per year. We used to have a number of them nearby, but many had closed. So, it's a bit further down the road to the closest one. I wish they would open one up here again. We go to Sonic about five times a year. there is not one close to us now, but we are moving and will be near one, can't wait to eat there! In a year? I would say probably 9-12 times. I would more often and it is not expensive I just dont have the money lol. I go to Sonic about once a month...more often in the summertime. I like to stop at Sonic whether hungry or thirsty. Love their diet Cherry limeade. So yummy! Can't wait to try the pretzels too! Maybe once every other month. This would be the first time going there. DH a couple times a month! I eat at Sonic about once per month. I've only been to Sonic once. We go to Sonic occasionally, more during the summer. We go about every other month. We go to sonic about once a month. I love their shakes! I don't eat there too often, but I tend to go about once a week when it's half price milkshake season! 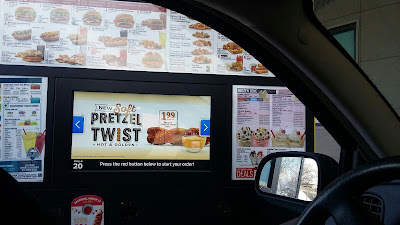 My husband and I both love Sonic and I would say we get there at least once every two weeks and since they have the pretzels now my husband goes by at least once a week for them or when ever he is in town!!!! I eat at Sonic about twice a year. I probably eat there about once every two months, so 6 times a year, give or take. Their shakes are fantastic. We only visit about once a year. We visit around 7 or 8 times per year. I love their french toast sticks and pretzel dogs. This would be my virgin time! I go a few times a year - love their cream slushes! We go to Sonic several times a month. Sometimes just for the Happy Hour Drinks! There is a Sonic by my office, so we go about once a month. Usually a few times during the summer for their limeades. I don't get to go to often cause it's a bit of a drive but every time I get to drive bye one I like to stop in and get a shake and food. I eat at Sonic about six times a year. I ate there once a week before I lost my job. We go more in the summer for the half of slushes so I would say about 30 times a year. I have never been to Sonic. We go to Sonic about 3 times a month. More so in the summer because their milkshakes are my favorite. I go to Sonic about twice per year. I like to go with my brother or a friend every once in a while. Maybe just a handful of times a year, but it's always fun. A few times a year. Mostly in the summer! I go to Sonic every couple of months or so. I like those nice shakes.